One of the questions in the exam is likely to involve drawing a specimen on a slide, using a microscope, or drawing from a photomicrograph (a photograph taking through a microscope). You might have to decide which part of a micrograph to draw. For example, there might be a micrograph of a leaf epidermis, and you are asked to draw two guard cells and four epidermal cells. It is really important that you do exactly as you are asked and choose an appropriate part of the micrograph. It is very important that you draw what you can see, not what you think you ought to see. 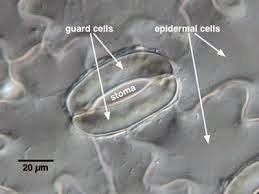 Forexample, during your AS course you may have drawn a TS of a stem where the vascular bundles were arranged in a particular way, or were a particular shape. In the exam, you could be asked to draw a completely different type of vascular bundle that you have never seen before. Look very carefully and draw what you can see. 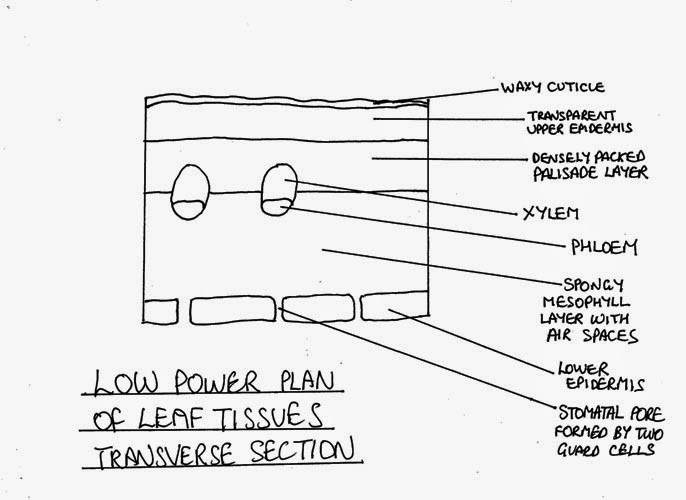 • show only the outlines of tissues if you are asked to draw a low power plan (LPP). A LPP should not show any individual cells. However, if you are using a microscope, you may need to go up to high power to check exactly where the edges of the tissues are. • write the actual labels outside the drawing itself. • Make sure you are familiar with the appearance of all of the structures listed in the syllabus that you could be asked about on the practical paper. You need to know the names and distribution of the tissues. Look in particular at the learning outcomes marked with [PA] at the beginning. • Practise using an eyepiece graticule to help you work out the relative proportions of different pares that you are drawing. • Take every opportunity to practise drawing specimens from micrographs or microscope slides, and either mark them yourself using a ClE-style mark scheme, or get your teacher to mark them for you. Find out what you need to do to improve, and keep working at it until you feel really confident. • Take one or two sharp HB pencils, a pencil sharpener, a clean ruler that measures in mm and a good eraser. • Settle down and take time to get your drawing of the specimen right. • Use your eyes first, then your memory. The use of a stage micrometer and eyepiece graticule is described on the post #3. You might be asked to do this on Paper 3. You could also be given the magnification of an image, and asked to calculate the real size of something in the image. Below is an example of the kind of thing you might be asked to do. This micrograph shows some cells from a moss. Notice that the magnification is given. 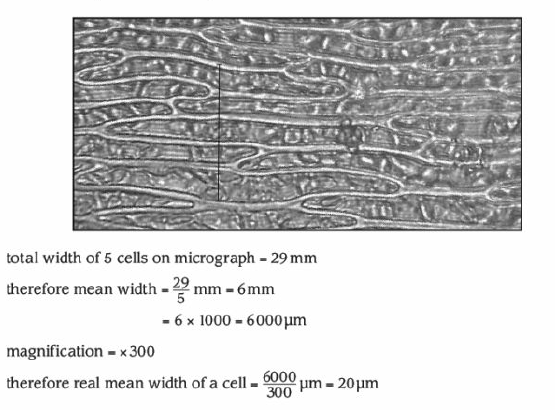 Let us say you are asked to find the mean width of a cell from the tissue in the micrograph. There are several steps you need to work through here. First, decide how many cells you are going to measure. It is generally sensible to measure a randomly selected sample of 5 to 10cells. Next, decide which ones you will measure. Choose cells where you can see the edges as clearly as possible, and where you can see the whole cell. If cells are evenly distributed, it is best to measure the total width of five cells in a row. That means you have to make fewer measurements, do fewer calculations and - better still - it reduces the size of the uncertainty in your measurements. However, if cells are irregularly shaped or distributed, you should measure each one individually. 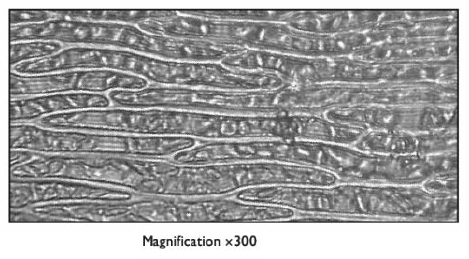 Once you have decided which five cells to measure, mark this clearly on the micrograph. It doesn't matter exactly how you do this - perhaps you could carefully use a ruler to draw a line across the five cells, beginning and ending exactly at the first edge of the first cell, and the last edge of the fifth cell. Now measure the length of the line in mm and write it down. Next, calculate the mean length of one cell. Show clearly how you did this. Next, use the magnification you have been given to convert this mean length of the image to a mean real length. You may be asked to compare the appearance of two biological specimens or structures. You could be observing these using the naked eye or a lens, or using a microscope, or you could be looking at two micrographs. The best way to set out a comparison is to use a table. It will generally have three columns, one for the feature to be compared, and then one for each of the specimens. • The table has been drawn with ruled lines separating the columns and rows. • The descriptions of a particular feature for each specimen are opposite one another (that is, they are in the same row) . • Each description says something positive. For example, in the first row, it would not be good to write 'not toothed' for Leaf A, as that does not tell us anything positive about the leaf margin. Note that the practical examination is likely to ask you to describe or compare observable features, not functions. Do not waste time describing functions when this is not asked for.